By far, the session I received the most value from during the morning talks of the Lean Startup conference day 1 agenda was Dan Milstein’s (from HUT 8 Labs) Risk, Information, Time and Money talk. Dan started out by restating the definition of a startup per Eric Ries: “a human institution designed to create a new product or service under conditions of extreme uncertainty’”. We are talking about established product lines well along the maturity scale. -) In the presence of extreme uncertainty, you make money by extracting information from reality. -) The most valuable information is that which reduces uncertainty about the largest in a chain of risks. -) To acquire information quickly, the whole team must constantly adjust its understanding of risks. 1) Build customer graphics at a rate of $200 p/h. Assume only 4 hours a day of work for a week (5 days). 2) Build a customer website at a rate of $20 p/h. Assume there is enough work to keep yourself busy 8 hours a day for a week. 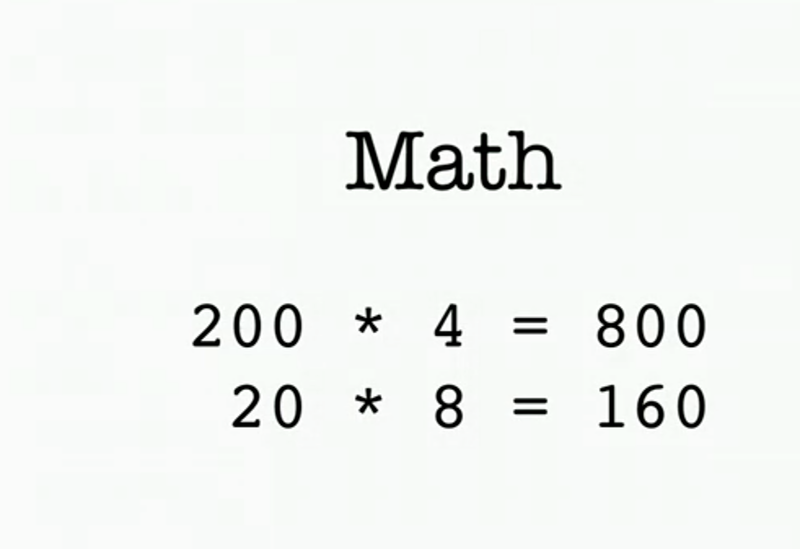 When he spoke these, it looked to be a straight math problem to me. So in this example… it certainly demonstrates that choice #2, though keeping you busy all day, is not the most profitable choice. 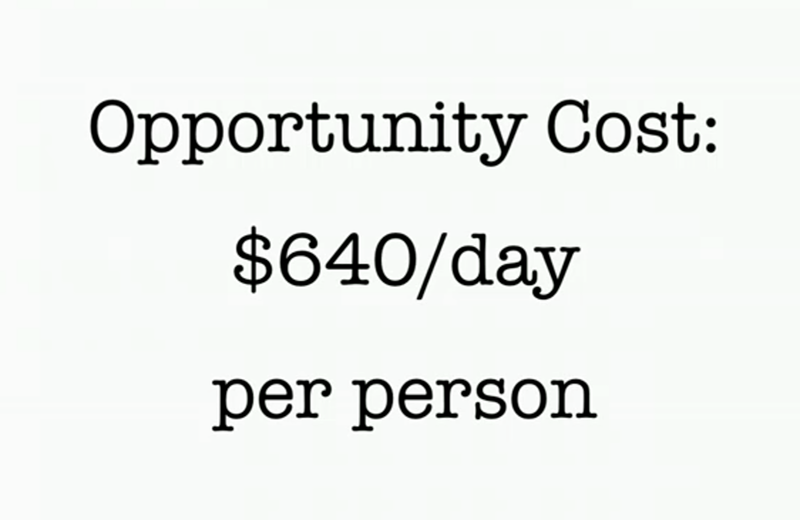 (Da… it gets better) It actually costs you $640 p/day per person. Sometimes people/companies get lucky… the ‘right’ work comes their way and the flip of the coin works out for them. Even in those situations, what are we talking about, getting the choice right 50% of the time? That is still, on average, a cost of $320 p/day. If working hard, and/or luck doesn’t determine success/failure, what does? Identifying when you are working on wrong things is key. Make sure you are working on the most valuable thing! The choice of what you work on is critical to success. It’s not how hard (or busy) you work, or how lucky you are, but instead it’s ensuring you are working on the right (or conversely NOT the wrong) stuff. 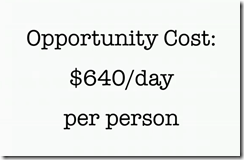 Dan goes on to state the these kinds of bad choices (opportunity cost wise) are happening all the time. He goes as far as to say: “if you aren’t sure you are working on the right thing, STOP working” You should be terrified of working on the wrong thing. At this point, Dan poses the question most (including me) have on their mind given the above example: Well, what if the customer requesting work doesn’t provide (hides) the rate of pay for an activity? How do you choose then? Dan says in this situation, Spend a week investigating both opportunities. That week of investigation makes us money! It leads to making the decision with proper context. So.. if gathering information = money…. What about the relationship of Risk and Information? To lower the risk of the startup, what should you do in the first month for each of the above? 1A) Attempt to ‘pre-sell’ 20 teleportation devices. 1B) Attempt to build a workable teleportation device. How about the first month of scenario 2? In first month, I think we all would agree to reduce risk, attempting to build a teleportation device is a better choice than preselling a teleportation device. I also think we would agree attempting to pre-sell the CRUD app during the companies first month is more important than attempting to build it (a fairly straight forward task). A startup is an information gathering entity. We only get information when there is uncertainty and risk. Demonstrated via the Degree of Surprise factor. This needs to be thought about when choosing where to spend peoples time. In a startup, the primary source of money is information. You should be searching out information that demonstrates a Degree of surprise factor. Ok. What about Time… how does that play in the picture? For a startup, Information = Money… therefore Revenue = Information/Time. The more quickly you gather the best information… the greater the chance of increased Revenue. Very often, you get the most/best information by going after your biggest risk items. (They would likely produce the most degree of surprise.) Many times, the things you have to do to get the most information change over time. 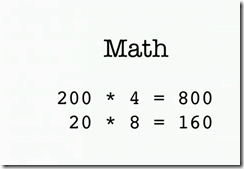 Walking the logic tree outlined throughout this post…. If your biggest risks change over time, and risky items yield the most information, and information = money, How fast people respond to changing risks is directly proportional to how well the company can make money. For the leaders out there, Dan states that a startup is really a chain of risks that need to be managed. Many leaders (he referred to them as CEO’s) actually call this their ‘vision’ as they don’t have a real tight grasp on them. Many times these leaders don’t articulate their fears (the chain of risks that need to be managed) and the company will have problems as those risks are the exact ones it should be attempting to test and extract information from… in the end yielding the revenue the company needs to at minimum, sustain itself. Managing a startup is really managing a chain of risks. Don’t keep those risks to yourself, but instead test them to yield the information your company needs to be successful. Though I had considered many times attending the Lean Startup Conference in San Francisco (12.9-11, 2013) over the past weeks, I was fortunate enough to find a Green Bay LiveStream host (thanks @rdkhatch for organizing) which allowed me to check out the conference virtually before spending a large amount of money on travel/hotel/etc. 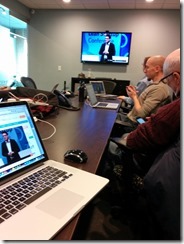 I plan to share info I picked up from the screencast sessions over the next few posts. I am not going to spend a ton of time attempting to define Lean Startup terms/etc with these note posts. I do expect to come back and do a few introductory posts on Lean Startup methods in the near future where those totally new to the topic can get themselves up to speed. 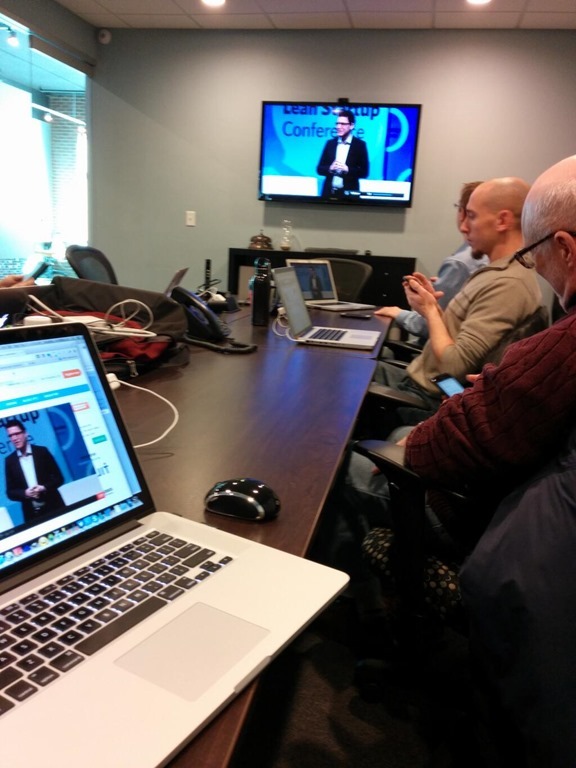 Eric Ries, the author of The Lean Startup book and host of the conference kicked off the day. 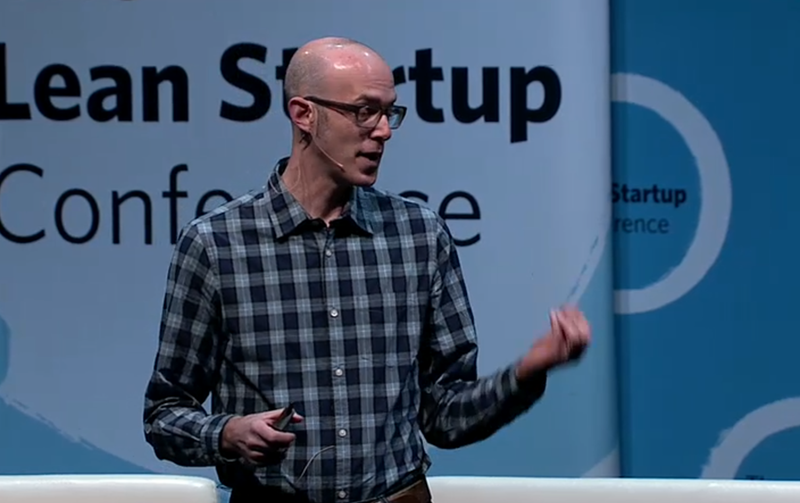 Eric states the lean startup looks very strong vanity metrics wise. He says there are lots of people jumping on the bandwagon now. It’s been two years since his book was released and five years of practicing the principles for him. 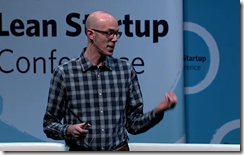 The question is, how are we doing as a Lean Startup community? Are we sharing/talking about the right things? Remember: a startup is a human institution under uncertainty. Traditional management practices of planning, forecasting, and tracking progress to plan just doesn’t work in times of increasing uncertainty. If an single employee in the company has an idea regarding how to innovate, or possibly improve efficiency, how does that idea percolate? Get implemented? Maybe even tested to see how it does? What is the process to get idea’s tested to see if they matter, make an impact? Who’s fault is it when we over engineer products? (like the microwave example above) It’s really nobody’s fault, the system failed and wasted peoples time and also potential. Do we have a routine and regular process to test and discover the ‘honest to god’ truth of whether it’s really going to make a difference or not? The new MikeKuphal.com is now up and running. After many failed attempts to transfer the content I blogged at mkuphal.wordpress.com via various WordPress tools, I finally broke down and manually copied each post. Side effect of this manual transfer is a lack of comments posted to the original blog posts. 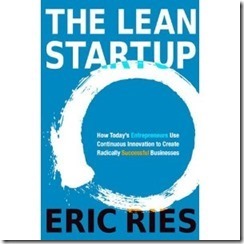 I am excited to start blogging again and plan to focus many of my posts on The Lean Startup book/movement. I have read and reread the book multiple times over the past 18 months. I get inspired each time I read it. 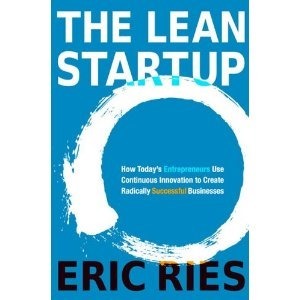 I have also read a number of other Lean Startup series books, and experimented with many of the recommendations/techniques shared both in the books as well as via Lean Startup based blog posts. Now it’s time to start sharing my thoughts related to The Lean Startup as well as other topics I am passionate about like Agile, Scrum, Mobile Development/etc.